NASHVILLE, Tenn. — The National Wild Turkey Federation presented the 2011 Land Stewardship Award to the National Forest Foundation during the NWTF's 35th annual National Convention and Sport Show in Nashville, Tenn. The NWTF has given the Land Stewardship Award each year since 1994 to forestry and utility companies and organizations for excellence in land management, partnerships and NWTF project support. The award recognizes those who have done outstanding work to benefit natural resources through land stewardship and partnerships. 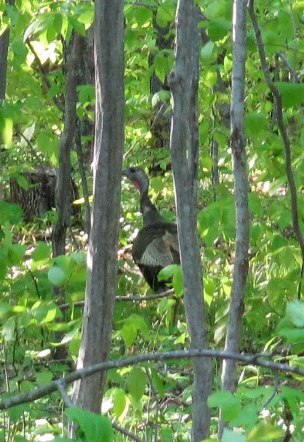 A turkey in the Croatan National Forest, established on July 29, 1936, located on the Atlantic coast of North Carolina. "The National Forest Foundation has become a strong partner of the NWTF on several vital conservation projects throughout the United States," said James Earl Kennamer, Ph.D., NWTF chief conservation officer. "Partnerships with NFF on projects in Pennsylvania, Oregon, Tennessee and Arkansas account for habitat improvement and restoration on more than 2,000 acres of forest, 59 miles of energy rights of way and construction of 30 ponds on our national forests." The NFF works with the U.S. Forest Service to bring people together to conserve and enhance America's 193 million acres of National Forests and Grasslands. As the nonprofit partner of the U.S. Forest Service, they engage America in community-based and national programs to promote the health and public enjoyment of the National Forest System. Together with partners and communities across the nation, the NFF helps restore forests and watersheds for their many benefits – from clean air and fresh water to wildlife habitat and outdoor adventure. "With the National Forest Foundation's focus on collaborative conservation, we deeply value the high-impact partnerships we develop with organizations like the National Wild Turkey Federation," said Mary Mitsos, NFF vice president. "NWTF shares our commitment to ensuring our public lands provide great habitat and great outdoor experiences, and we are honored to be recognized by a fellow conservation organization in this way." The NWTF is a nonprofit conservation organization that works daily to further its mission of conserving the wild turkey and preserving our hunting heritage. Through dynamic partnerships with state, federal and provincial wildlife agencies, the NWTF and its members have helped restore wild turkey populations across the country, spending more than $331 million to conserve 15.9 million acres of habitat for all types of wildlife.